Amazon add money offer, Amazon pay balance cashback, Amazon pay cashback trick, Amazon Pay Add Balance & Get Cashback – Hello Tricks Store Readers, First of all “HAPPY NEW YEAR” to all of you. You guys are awesome please stay with us. I am here to support you always where i can. Hope you are enjoying our New Paytm UPI Offer and Free recharge apps 2018. Now celebrate your new year with amazon pay cashback offer, Now get 10% Cashback when you add money on Amazon Pay Balance (All Users). 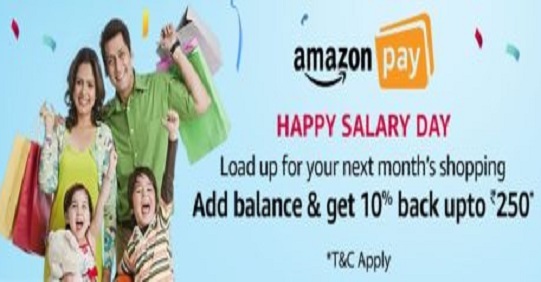 Amazon is back again with amazon pay add money cashback offer as “Happy Salary Day Offer” in which you will get 10% Cashback up to Rs 250. Also, the offer is valid on Minimum Load Value of Rs 250. The offer is valid from 1st January to 3rd January 2017. So Hurry up guys and fill up your Amazon Pay Balance wallet. 3. Just enter any amount min 250 or you can Rs 2500 (For Maximum cashback of Rs 250 for All Users). 4. After that just proceed for checkout. 6. You will get the 10% Cashback Maximum up to Rs 250 in your Amazon Pay balance account. That’s it guys now enjoy the offer as well as cashback & yes don’t forget to share with others too. * This offer is valid from 1st to 3rd January 2017. * The applicable cashback amount will be credited in the form of Amazon Pay Balance within 3 days of the transaction. * No minimum add limit to avail the offer. * Maximum cashback you will get of rs 250.